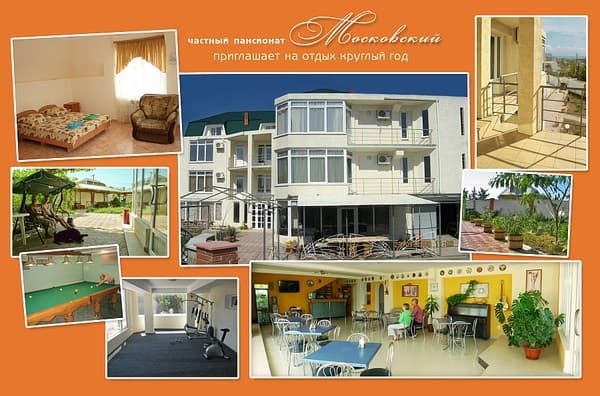 Private boarding house "Moskovsky" is located in the center of the resort part of the city with a view of the Sudak Bay and the Genoese fortress, 300 meters from the Cypress Alley - the epicenter of the resort life of Sudak. 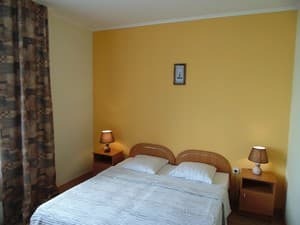 The boarding house "Moskovsky" offers accommodation in 2-, 3- and 2-bed rooms, located in a 4-storey building of modern construction with terraces and balconies. 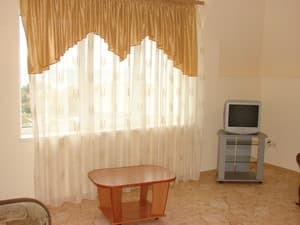 Each room has air conditioning, refrigerator, TV (cable TV). 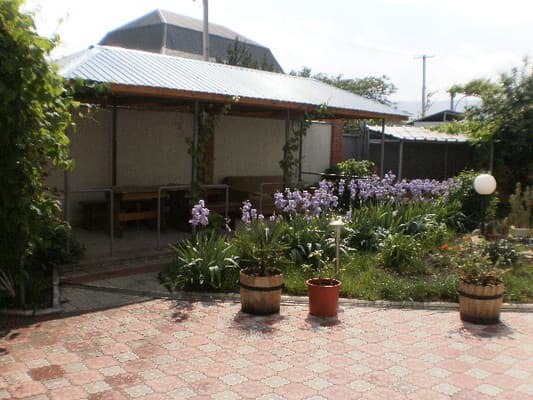 There is a dining room, parking, laundry, billiards, safe, free Wi-Fi Internet, fitness equipment, library, barbecue. 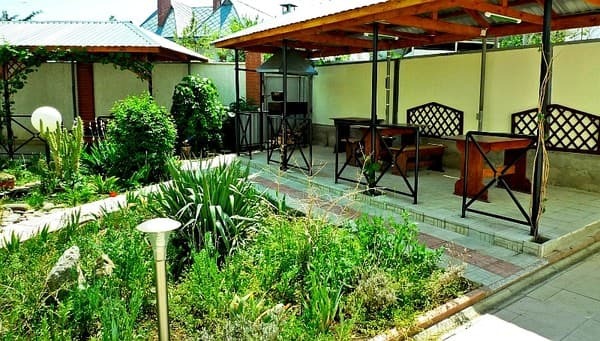 The successful location of the boarding house "Moscow" allows you to quickly get to the developed infrastructure and at the same time enjoy a quiet and comfortable holiday. 300 meters from the hotel there is a market, shops, children's attractions, the central street of Lenin. 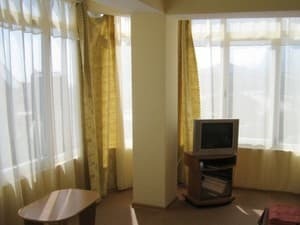 One of the advantages of the hotel "Moskovsky" is its location on the hill, which allows holidaymakers to watch from the windows behind the stormy life of the city, and in the room will be quiet and calm. To the beach of the holiday house "Sudak" - 650 meters, to the Central beach - 750 meters. The distance to the bus station in Sudak is 2 km. 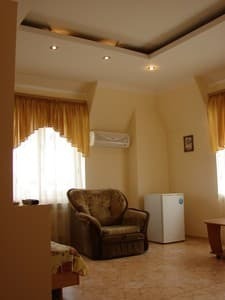 Description of the room: The room has air conditioning, refrigerator, TV, double bed, folding armchair-bed, bedside tables, wardrobe, journal. table. SANUZEL COMPLETE ON THE LADDER SITE, IN 2 METERS, ONLY FOR THIS ROOM. Description of the room: One-room spacious room with balcony. In the room there are two beds, bedside tables, a coffee table, an armchair-sofa, a closet, a bathroom. Description of the room: One room with balcony. In the room there are two beds, bedside tables, a coffee table, a folding sofa, a closet, a bathroom. Description of the room: Two-room suite with a terrace. In the room there are two beds, bedside tables, a wardrobe, a coffee table, a folding sofa, 2 armchairs. The cost of additional space is 70% of the cost of the main one. Additional place for children from 5 to 14 years - 50% of the basic. Extra bed for children up to 5 years old - free of charge. In the center of the resort part of the city overlooking Sudakskaya Bay and the Genoese fortress, 300 meters from the Cypress Alley. 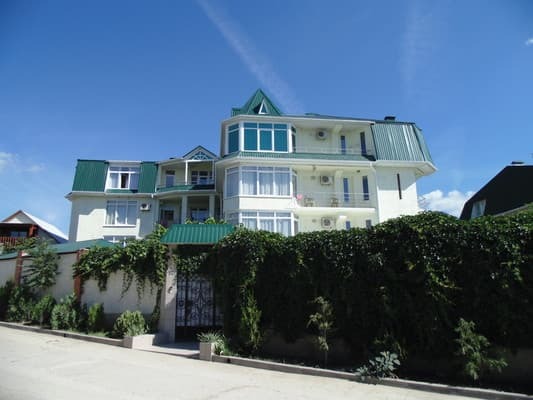 To the beach of the holiday house "Sudak" - 650 meters, to the Central beach - 750 meters. The distance to the bus station in Sudak is 2 km. Directions to Simferopol, Feodosia, Kerch. Further by bus, taxi to Sudak. In Sudak, guests will be met by car for free. 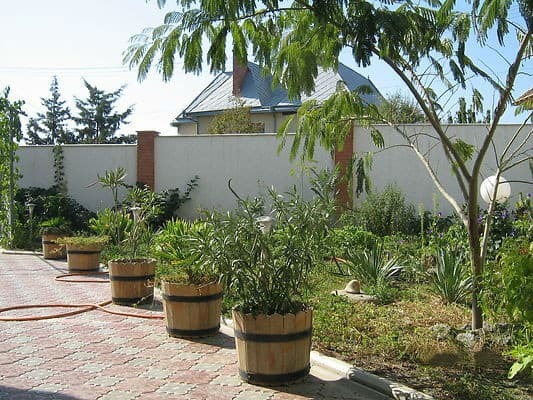 We can organize a transfer from any city in the Crimea.